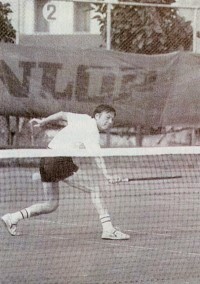 My friend Patrick Cowsill mentioned on his blog the other day that I was getting a piece together on tennis in Taiwan. That’s the plan but I still have a fair bit of legwork to do before I have the material I need. The inspiration for the piece is the last of Taiwan’s so-called “three kings” , a lovely chap named Tommy Tang (唐福順‏) who a friend of mine bumped into by chance at his little shop in Yuanshan. Tang was Taiwan’s No. 1 well into his late 30s, before Lu Yen-hsun was even a glint in the biandang delivery man’s eye. He took a couple of games off Ivan Lendl in 1980, in the short-lived ATP Taipei carpet tourney and bashed some friendly balls around with the likes of John Newcombe and Pancho Gonzalez. I like the Dunlop ad that’s falling down in the background. Any idea what court he’s playing on? Where was the tournament played? Not sure on both counts. The pic’s not from the ATP, which was carpet. Besides, he was a lot older (reckons he was 43 when he played Lendl), with a bushy mane by then. .-= FOARP´s last blog ..You have much to learn young grasshopper . . . =-. You like eh? Need to get on to this … Think I have two stories here. Just need to find the time.